Really, you never know who you’re going to meet up with out there. Six or so weeks ago, while in Jackson, MS, I stopped by the legendary Malaco Records to do some coverage for the book and take a quick run through the old recording studio. If you know your southern soul and gospel history, then you know the Malaco pedigree and the depths of its roots. When I arrived at the studio the gentleman who was to show me around turned out to be none other than recording engineer Jerry Lee Masters of FAME Studios/Muscle Shoals Sound notoriety (though I’ll freely admit that I didn’t realize this until we got into a conversation about sixties soul music in his office 15 or so minutes after we met.) On his wall there was a black & white framed photograph featuring a group shot of 20 or so long-haired gents that I surmised was taken in the early ’70s. Jerry informed me that it was a group of his friends taken in the seventies in Muscle Shoals, AL (and went on to point out every person in the photograph), several of which included session men David Hood, Roger Hawkins as well as singer-songwriters John Prine, and Kris Kristofferson, who were renting out the studio at the time. 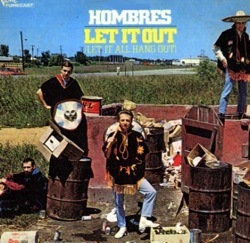 As we talked shop (his working with Dylan at Muscle Shoals, etc) I learned that Masters was in the Hombres, the Memphis garage band that penned the classic, one hit wonder, “Let It Out (Let It All hang Out),” a song I’d listened to hundreds of times over the years. Masters, ever the gentleman, went on to indulge my curiosity, spinning many a great tale about life in the band – and on the road – back in the late sixties. Having most recently gained a renewed notoriety via the soundtrack to Cameron Crowe’s 2005 film Elizabethtown, “Let It Out (Let It All hang Out)‘s” true roots lie in countless garage rock compilations (e.g. the Nuggets box set) and even more teenage mix tapes. Jerry Masters, who bills himself as a “Rock Star”, is a ne’r-do-well who was nothing more than a one-hit wonder, who sat by as his wife worked her fingers to the bone to support this lazy, selfish man…a man, who after 30years of taking advantage of his wife, left her for another woman who won’t ask him to get a job…a man who tells his mistress that he loves her in “Jesus’ holy name.” Good riddance.